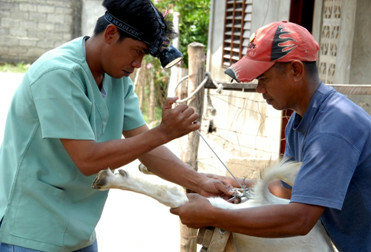 A goat undergoes artificial insemination, a breeding tool that will be used by the program for dairy goat herd build-up in the countryside. The country is being envisioned to become a land of milk in a couple of years, goat milk that is. Through the PCAARRD-funded National Dairy Goat Science and Technology (S&T) Program, milk production from goats is expected to increase in the country by 150% by 2017. The program will work on initially increasing milk production in backyard farms from 45 liters in 90 days to 135 liters for each 180-day lactation and 180 liters to 360 liters for each 180-day lactation in commercial farms. The strategy of scientists from the implementing agencies, namely Isabela State University, Central Luzon State University, Bohol Island State University, Department of Agriculture-Regional Field Office-8, and University of the Philippines Mindanao, is to increase milk yield per doe by selecting the best performing dairy breeds and breeder animals suited to the country and by providing appropriate nutrition suited to the characteristics of these chosen genotypes. For starters, project implementers will conduct an inventory of stocks and evaluate the performance of dairy goats across the country. Results of the evaluation would lead to the selection and infusion of good breeds across the country through artificial insemination and buck loan programs. A herd build-up of at least 58% is expected with this intervention. With regards to nutrition, the performance of Indigofera as dairy goat feed will be validated. Although some progressive farmers have claimed that this species is responsible for the sustained high milk production of their herd, research data has to be generated and analyzed. To abate the increasing incidence of subclinical mastitis, a program on its control will be implemented. Mastitis was identified by goat raisers as one of the greatest problems faced by the industry. The condition can reduce milk volume and alter its composition; lower its hygienic value; and impair the processing of quality milk. At present, there are no local standards to screen and evaluate goats with intra-mammary infections, particularly at the farm level. Thus, management risk factors that influence the development of the infection will be identified and a control protocol will be developed and disseminated to the goat farmers. The application of the protocol is expected to reduce the incidence of mastitis by 37%.